Did object oriented ontology get buzzy with aesthetic circles simply because it had the word “object” in it? Objects have really become the stars in the recent decade; art objects comply with the paradigm of products displayed in online catalogues like ebay and amazon. This, and one of the chief theorists of object-oriented ontology and “speculative realism” more broadly, Graham Harman, has been serving as a kind of liaison, speaking before art schools and wading into aesthetics in his exploration of oblique access to a world of intimately interrelating objects. Visual artists tend to take it way too literally— hiding stuff in locked jewel cases, or under blankets, for example, or construing “object” as physical objects, like Fiji Water, rather than in Harman’s larger sense. Except for a few special cases, I actually think correlation is more or less right: that we cannot see what the world looks like when no one’s looking. However, I also respect the speculative realist’s addendum: that there are nevertheless infinite interrelations in which humans and their thinking play no part. McElheny’s is a “special case.” By the use of all mirrored surfaces, as well as oneway mirrors for the case itself, we get an oblique glimpse of the world without us— at least figuratively. We see an empty mirror. 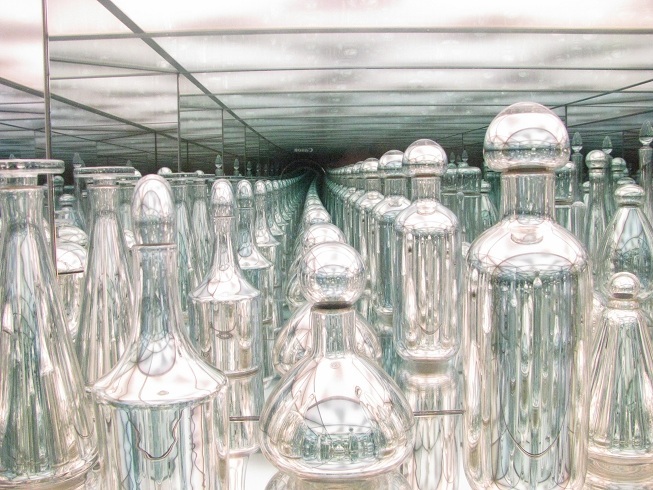 Not only are there no eyeballs, there isn’t even an original object to be reflected. Just mirrors of mirrors. Light ricocheting forever and ever, off the contours of the glass bottles, like an infinite racetrack, whether we’re looking or not. Pure form, zero content. Speculative works usually get short shrift. They come across as too detached from “the social” or didactic, especially if they illustrate something physical or mathematical. But if done well, there’s a dignified place for principled didacticism and willfully “asocial” works (in quotes because mathematics and physics are still partly social, incorporating into their fullest accounts both being and thinking). They can also be incidentally or casually speculative. Years ago I had this vision of ten identical televisions in a row, each playing the film Mac & Me (a weird product-laden, E.T. knockoff), only with every set staggered by a fraction of a second, so that the image would cascade across the screens. The point was to bifurcate our sense of continuity: we’d have to choose between following the image in time (through change on the same screen) or in space (through movement, as it leapt onto the adjacent screen). It was “speculative” in so far as it deeply screwed with fundamental categories: change, continuity, space, time. I never did it because I’m lazy. Petra Cortright nailed it years later though (above), playing with her video set-up. I like this more in that these categories arise through very pragmatic interactions with our environment; when the environment changes (through technical mediation in this case), the categories follow. The contingency of our categories will rarely be understood through intellectual exercise but through new toys and technics that will force us to negotiate in new ways.